(Nanowerk News) At the Institute of Bioengineering and Nanotechnology (IBN), A*STAR, in Singapore, Jun Yang and Jackie Ying have developed a new protocol for the synthesis of tiny metal and semiconductor crystals that are a few billionths of a meter in size ("A general phase-transfer protocol for metal ions and its application in nanocrystal synthesis). The efficiency and structural control provided by this method could revolutionize the production of nanocrystals and their hybrids, which have diverse applications in medicine, electronics and energy. Typically, synthesis of a metal nanocrystal begins when a reducing agent is mixed into a solution of metal ions. The reducing agent donates electrons to the ions, causing metal atoms to crystallize out of the solution. If left unchecked, the metal crystals agglomerate into larger and larger complexes. Consequently, scientists use a capping agent—normally a thin monolayer of long organic molecules—to cover the nanocrystals, arrest growth and preserve their size. Fig. 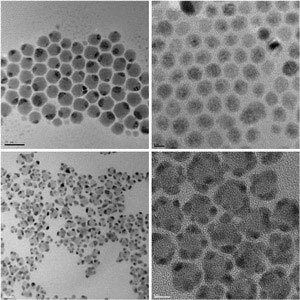 1: Transmission electron micrograph images of nanoscale composites of noble metal and semiconductor crystals produced using a new synthesis protocol. Top left, silver-sulfide/silver (Ag2S–Ag); top right, cadmium-sulfide/silver (CdS–Ag); bottom left, cadmium-sulfide/gold (CdS–Au); bottom right, lead-sulfide/gold (PbS–Au). One drawback with this procedure is that metal ions tend to remain in an aqueous solution, which does not mix well with the organic liquid required to dissolve the capping agents. To remedy this, chemists add a phase transfer agent, which is a molecule that can bind to the water-dissolved metal ions and move them into an organic liquid. Currently available phase transfer agents, however, are only active with specifically charged systems, limiting their use. Yang and Ying discovered that a molecule called dodecylamine (DDA) in ethanol solution could act as a highly general phase transfer agent for nanocrystal synthesis. Using the DDA agent, they transferred a wide variety of metal ions—silver, gold, iridium, palladium and platinum, to name a few—to an organic medium with greater than 95% efficiency, and readily turned the ions into uniform, stable nanocrystals. The DDA-based protocol could also be used to create an assortment of nanoscale composite materials. For example, the researchers produced new nanocrystal alloys using two types of noble metal ions in the starting mixture. In a ‘core–shell’ process, they grew another material around an existing nanocrystal to yield novel metal–metal and metal–semiconductor hybrids (Fig. 1). Ying says that these nanocomposites are of great interest because they allow specific functionalities to be tailored into the materials. Several applications, such as chemical catalysis and biocompatible fluorescent imaging, were possible with the synthesized nanocrystals. Furthermore, the DDA-based protocol may be used for critical environmental purposes such as extraction of heavy metals from contaminated soil or water. Such applications, says Ying, are natural extensions of nanocrystal research that demonstrate their promising possibilities.